Ascalon Hampton Bench: The Ascalon Hampton Bench is a traditionally designed metal garden bench with appealing Gothic-style arched shaped metalwork on the backrest. 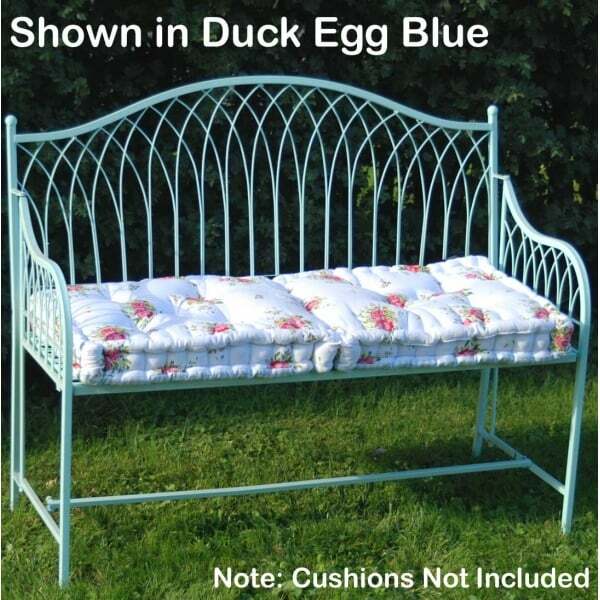 The steel garden bench is available in a range of colours, either sage green, cream, or duck egg blue. The bench is foldable, meaning that it arrives preassembled and can be easily and quickly folded for storing when not in use. A strong a durable garden bench, the Hampton is made from steel and is powder coated to ensure long life and some resistence to weathering issues such as rusting. The design of the bench features attractive late medieval inspired arches on the seat back and armrests, a graceful wirework mesh seat, and strong steel supports that make this a sturdy and hardwearing piece of garden furniture. Sure to add value and decoration to any garden or outdoor area, the Hampton is a beautiful folding garden bench that is sure to provide comfortable outdoor seating for many years. Prompt delivery to your address. No assembly required. Cushions shown in product images are not included.